With a history that dates back to 1937, Caesars Entertainment is one of the most recognized and trusted names in the gaming business. Caesars has long been renowned for having some of the best sportsbooks in the world and it has taken the experience online with the Caesars Casino and Sports online sportsbook and app. Bet on the go — safely and securely — from anywhere in New Jersey! Mobile friendly: Make bets on the go with the Caesars Casino and Sports Real Money Casino app available anytime, anywhere in New Jersey on PC/MAC, iOS and Android devices. Bet on all the biggest events: Caesars has all the major sports covered with baseball, basketball, boxing, football, hockey, soccer, and more. Bet on spreads, totals, money lines, props, futures, and specials. 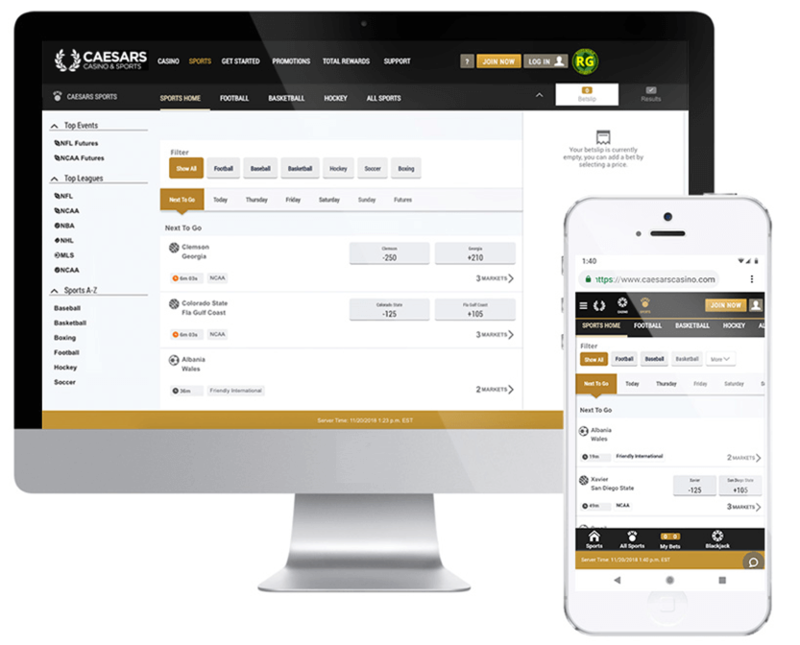 User-friendly platform: Though a relatively new platform, Caesars did its homework and has provided its users with a clean, easy-to-use experience, both on desktop and mobile. Caesars Casino & Sportsbook doesn’t charge any fees for its withdrawal services. Get a $10 free bet just for signing up — no deposit required! Simply enter promo code COVERS and start betting on your favorite matchups today. See terms and conditions HERE.